MMMagicHat is a wide-brimmed pointed hat - a "magician's hat" or "witch's hat" - for Aiko 3. It was created by mamomamo. 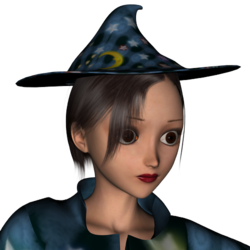 The hat is textured to coordinate with the "StarMoon" texture for MMDressForAiko3. This page was last edited on 20 October 2017, at 19:24.